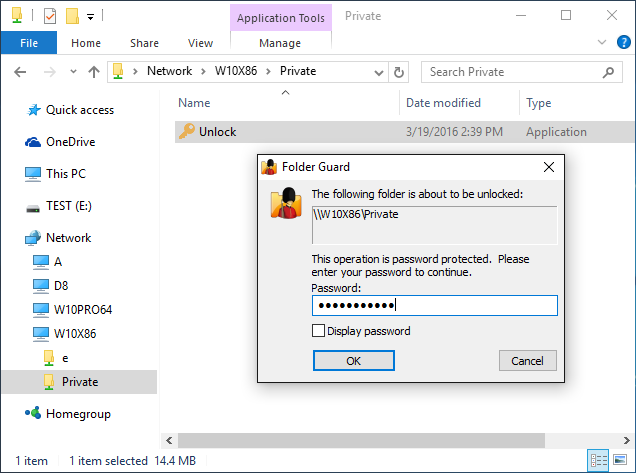 To protect a shared folder with a password, first make sure the folder is shared and accessible from other computers. 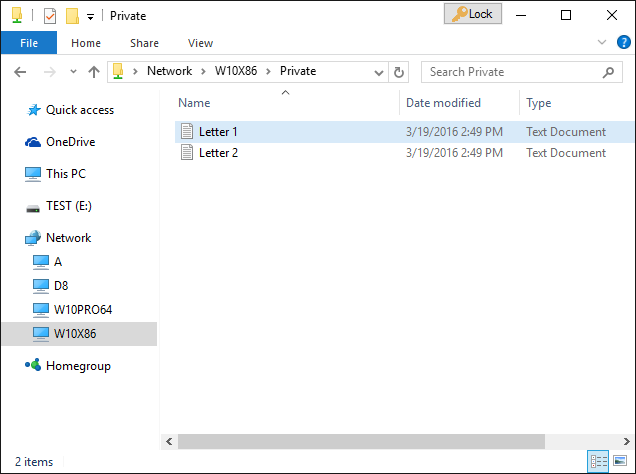 To share a folder, run Windows Explorer, open its parent folder, right-click on the folder you want to share, and choose Share (or Share with) from the menu. Before you can share folders, you may need to adjust the security settings of your computer, such as enable Network discovery, etc. Please refer to Windows Help for more information on sharing the folders. Make sure the shared folder is accessible from other computers before continuing. 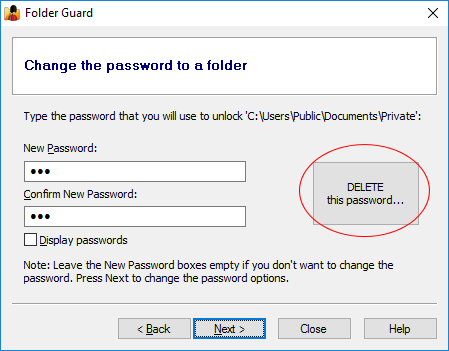 After you have shared a folder, create a subfolder that you want to password-protect with Folder Guard. (The top level shared folders cannot be password protected, sorry.) For example, if you have shared the folder C:\Users\Public\Documents, create a subfolder named Private under it. Folder unlocked but its view is not updated? Optimizing the computer for faster updates of the network folders involves adding a value to the Registry. You can choose Yes, and Folder Guard will add this value for you. (Note that the administrator approval is still required for it to actually happen.) You can also update the registry manually, following these instructions . 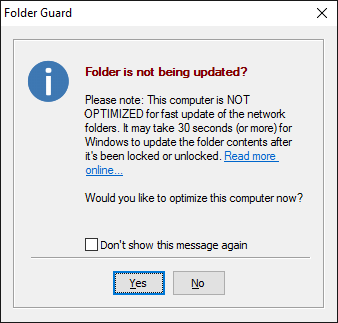 If, however, you see the updated contents of the network folders fast enough, or if you don't want to optimize your computer, check the Don't show this message again box, press No, and Folder Guard will no longer bother you with this message. 2. Right-click on the Folder Guard notification icon and choose the Lock command from its menu. (Note that after all previously unlocked folders have been locked back, the notification icon is automatically removed from the taskbar. 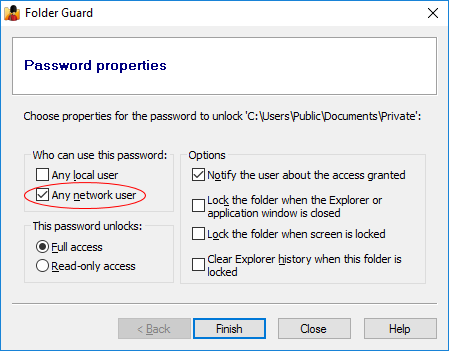 Is it necessary to install Folder Guard on a computer in order to be able to unlock access to a password-protected shared folder on another computer? No, it is not necessary. If a computer does not have Folder Guard software installed, a user of such a computer can unlock a shared folder by running the Unlock utility directly from the shared folder, as described above. 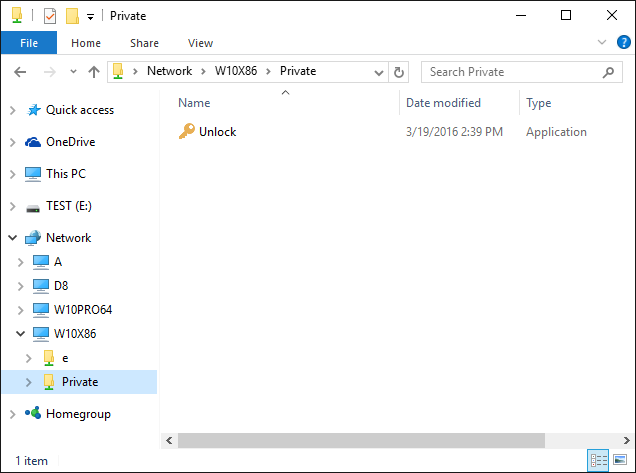 Can a shared folder be unlocked from a computer that does not run Windows? No, only computers that run a supported version of Windows can unlock the password-protected shared folders. If a computer has a different OS, such as Linux or OS X, such computer cannot run the Unlock utility (which is a Windows-only program) and therefore it would not be possible to unlock the password-protected folder from such a computer.